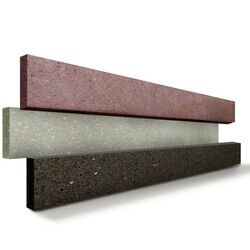 EASY STONE Natural Stone Predecorated Gypsum Sheathing Panel Outdoor 12"x24" Natural Stone Stips Panel / Red, Black & Beige Color / 5" x 33" x 5/8"
Size: 5" x 33" x 5/8"
Easy Stone® High-tech wall panels brings together two proven technologies. 1.- Lightweight Gypsum Glass- Mat Lined Panel Mold Tough with a high strength-to-weight ratio composite, noncombustible gypsum 2.- Reconstructed Natural Stone Veneer Produced with cutting edge Technology. The natural finish face is folded around the long edges to protect the core and the ends are cut square and even. Easy Stone Panel is an innovative Stone Panel technology that delivers built in control, confidence and performance from installation through the entire lifecycle of the building. From our outdoor product line comes the new Easy Stone 5"x33" panels. Great for walls and high-end fronts, our panels are designed to increase your construction value with the elegance and style that only natural stone can give. Made with recycled stone over a light plaster substratum, our moisture resistant Easy Stone panels are also lightweight, element-resistant and easy to install. Each box contains 9 pieces of 5x33 Inch, with a weight of 4.89 pounds per unit, 70% less than regular decorative stone. Construction systems with the ideal size and weight to reduce transportation and montage costs. At the same time, the Easy Stone 5x33 inch outdoor panels will save you time, money and effort thanks to its easy to install design. You don’t need special labour or advanced tools to install them. Just take them out of the package, prepare your wall (clean it first so it doesn’t have any paint residue or dust), add some industrial adhesive at the back and place the pieces any way you like. Designed for outdoor walls, the Easy Stone panels come in 3 different colors: Obsidiana (black), Marble (beige) and Tezontle (red), give a versatile look to your home or office through different patterns; a reflection of creativity and good taste with 100% natural material. Elegant and Stylish Natural Stone. 5" x 33" x 5/8"
Stone Siding - Slate Collection - Ledge Stone / Autumn Mix 6"x24"
Slate Stone Siding - Desert Black / Ledgestone Flat / 6" x 24"
Natural Ledge Stone - Travertine - Durango Cream / Ledge Stone / 6"x24"
Quartzite Stone Siding - Gray Stone / Ledgestone Flat / 6" x 24"
Quartzite Stone Siding - Bermuda Green / Ledgestone Flat / 6" x 24"
Sandstone Stone Siding - Atacama Desert / Ledgestone Flat / 6" x 24"
Quartzite Stone Siding - Pure White / Ledgestone Flat / 6" x 24"
Slate Stone Siding - California Gold / Ledgestone Flat / 6" x 24"
Slate Stone Siding - Multi Color / Ledgestone Flat / 6" x 24"
Slate Stone Siding - Harvest Blend / Ledgestone Flat / 6" x 24"
Quartzite Stone Siding - Mocca Splitface / Ledgestone Flat / 6" x 24"